As we reach the half way point of 2016 and before the staff become busy welcoming guests, we are able to reflect on a successful six months at Craiganour. At the heart of the estate the Lodge has played host to a number of family gatherings throughout 2016. Guests have enjoyed a variety of activities whilst staying with us including; clay pigeon shooting in the grounds, boating on the loch and tranquil walks up the hill. The Skyspace continues to attract visitors from all over the globe with parties having travelled from Canada and America in recent months to enjoy the artistic piece. The arrival of Andrew, our new gardener, at the end of 2015 has resulted in the installation of new raised vegetable beds in the garden. 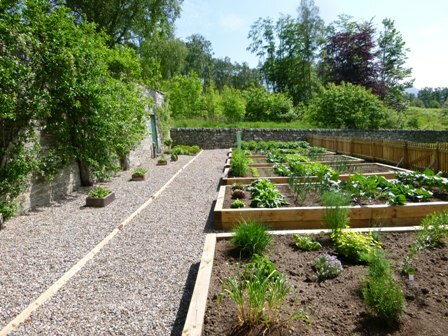 A welcome addition to Craiganour, the fresh produce from these beds is used by the caterers for guests in the Lodge. The estate hydro scheme is taking shape and is scheduled for completion later this year. Hydropower is a renewable energy source which is fuelled by water which means that it does not pollute the air thus reducing Craiganours' carbon footprint.A large number of contractors have been on the estate for several months installing the complex infrastructure this 800 kW scheme requires. We look forward to seeing everyone’s hard work come to fruition when the estate will be able to boast the production of 2,000 MWh/pa of hydro electric; enough to power 470 homes. Our farm has had another successful lambing with lambs having been out in the fields since April. More recently, the first of this years Highland calves have been born. Looking towards the rest of the year our game keeper, Tom, has been working hard in preparation for the season. We look forward to welcoming our sporting guests over the next few months and seeing what this years season brings out on the hill.